Our Double Wall cardboard boxes offer extra thickness which provides your precious goods with added protection in transit, and all the peace-of-mind you need when it comes to shipping orders to your valued customers. And because they’re double the strength, they’re the perfect choice for moving house and long-term stacking too. Reduce the risk of returned damaged goods with our removal experts. 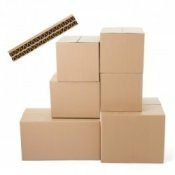 Size: 5" x 5" x 9"
Size: 4" x 4" x 13"
With cushioning protection, our Double Wall Cardboard boxes are constructed with two layers of corrugated fluting, which are then bonded together to create strong, robust, long-lasting boxes that your business and customers can depend on. The added protection provided by the dual fluting not only makes them great for shock absorption, but also creates the extra strength needed to carry those heavier items - from those heavy cookbooks you get every Christmas, to your ever-increasing collection of sports trophies! All this additional strength means the boxes have got some great storage benefits too. So if you’re stacking your stock in a storage facility for some considerable time, you’ll be safe in the knowledge these stellar boxes will stand up to the test!